Examine the role of diasporas in preserving culture in one country and the adoption of minority traits by host societies. Read and highlight the article. Name 3 famous examples of diaspora communities and provide data explaining their importance. Click on and read the pdf above. Take bullet point notes on the history of Caribbean recruitment in London. Write a one paragraph summary. Using one or more examples, analyse the impact of diasporas on local cultures [10 marks]. “Diaspora” describes a scattered community of common ancestry. Diaspora can be a product of migration or of territorial disintegration leaving a cultural group straddling different national borders. Likely examples for analysis will include: Polish, Chinese, Jewish, Indian, Irish, Scottish, English, Caribbean, Nigerian diasporas – but there are of course many other possibilities. Credit should be given to answers that provide clear details of the global diaspora pattern(s). The preservation of migrant culture is a common diaspora trait, albeit in hybridized or fossilized forms, both of which may be explored, depending on the view taken of what “local culture” means. The adoption of minority diaspora traits by a host country culture (for example, US “melting pot” ideas) is another approach. The answer could discuss how the local culture of the origin country (for example, Ireland, Poland) may have been affected, for example, “fossilization” of the tourist industry. Another approach might be to address the great variability in local cultural forms for different parts of a diaspora (for example, comparing Jewish culture in the UK with that of the USA). The approach taken will depend on the example(s) used and each answer should be credited in terms of its merits and should not be negatively marked if many of the themes suggested by this markscheme are not present but other valid content is provided. At the band C/D border, the focus on diaspora may still be insecure (for example, the concept of scattered population not fully understood), or the answer is more concerned with the impacts of a simple migration flow, but the focus on cultural impacts should be secure (alternatively, may have a good grasp of what diaspora is but fails to focus on culture). At the band D/E border, expect some range of impacts to be addressed for a named and understood diaspora. At band E, the diaspora concept ought to be handled well (may consider cultural impacts for source and various hosts, or compare the cultural traits of different regional communities within the global diaspora). To what extent is Ali G an example of the adoption of minority traits from the West Indies in the UK host society? Briefly describe the 5 main objectives of the "decade of the world's indigenous peoples". Create a case study file focusing on the impacts of cultural diffusion on the group, making clear connections with international interactions. Examine the ways in which international interactions may result in the homogenisation and dilution of culture. Why has the McDonald's model proven so successful? Could the same process be applied to other industries/institutions? Identify the key words in this question. What strategies should you use to approach a discuss exam question? Work in pairs to write an essay response to the following exam question. Elaborate each topic sentence into a paragraph using the resources provided. What is your position on this exam question? Which camp do you agree with? Justify your views. 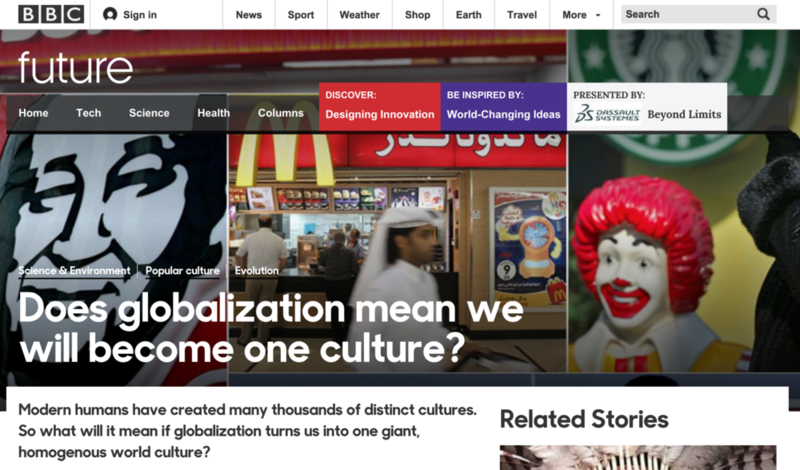 Define and exemplify the concept of cultural imperialism. Read the pages 175, 178-180 of HL Guinness book. Summarise 5 arguments in support of cultural imperialism.